Today we decided to visit a few estates in Wellington. We started at Diemersfontein as it was about time I found out for myself how good their Pinotage really was. 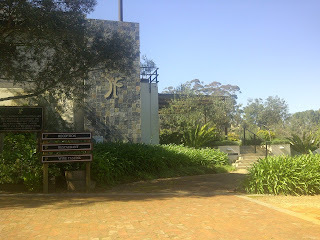 This is a nice wine estate. They have a lovely view, a nice set up and a pleasant restaurant also. 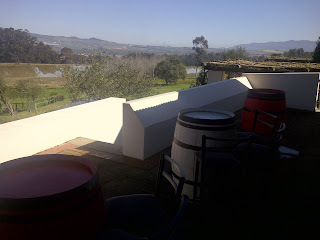 We went to the tasting room first and had to wait around 5 minutes before someone finally arrived to serve us. It was not a train smash (as the locals like to say) but not exactly a good start/first impression. Anyway, once Aubern was there, he informed us that we could taste 6 wines each and that the tasting was free. As they have 14 wines, we chose 6 different wines each so we could try a total of 12 of the 14 wines. You would know from my previous reviews that I don't like to choose in case I miss out, so this was ideal. 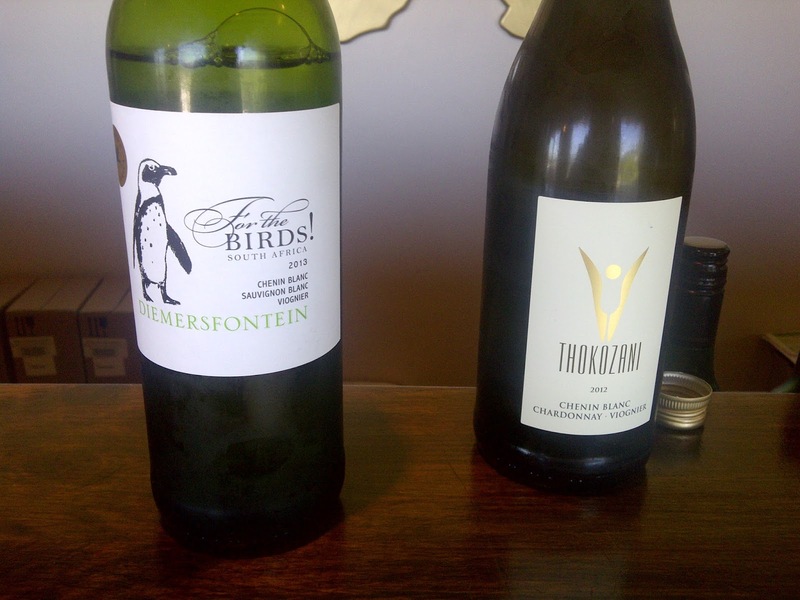 We tried the For The Birds White Blend 2013 (R45 a bottle) first. This is a blend of 55% Chenin Blanc, 35% Sauvignon Blanc and 10% Viognier. I found this light with a nice tropical aroma, tones of apricot and dried apricot flavours. 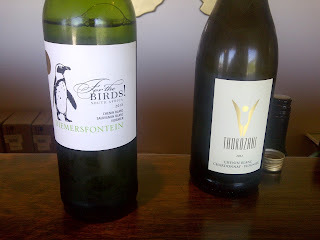 The second wine we tasted was the Thokozani Chenin Blanc/Chardonnay/Viognier 2012 at R55 a bottle. This was nice, smooth and medium body. It had nice layers and flavour, there were hints of pineapple and lime. It had a nice lingering finish and had a full mouth feel. I liked it. Viognier 2011 at R89 a bottle was next. It had a beautiful citrus aroma, was a lovely smooth, fruity wine. Slight tones of apricot on the palate. It was nice. However, I didn't like the aftertaste. Chenin Blanc 2011 at R89 a bottle was lovely, smooth, not overwhelmingly fruity, lovely lingering finish, balanced acidity, I liked it!! Chenin Blanc 2013 at R49 a bottle was fresh, fruity, had nice acidity and a fresh finish. It was nice. For the Birds! 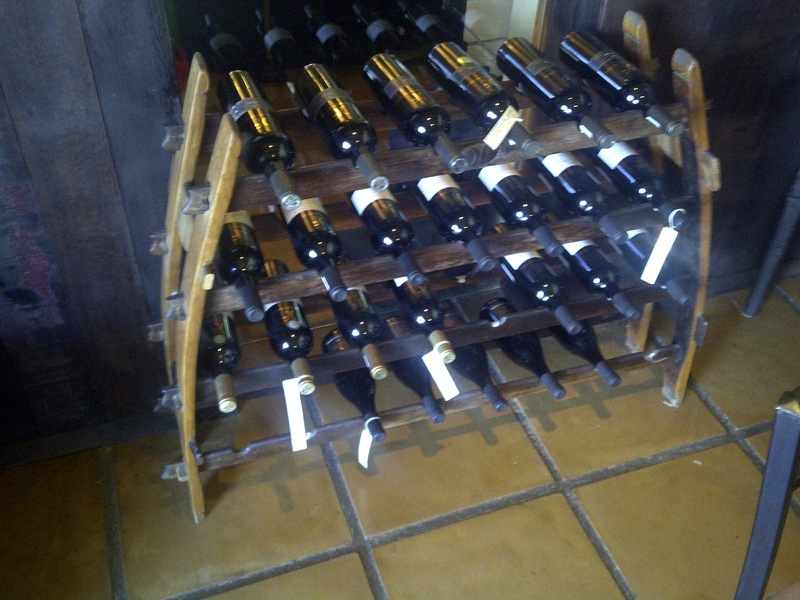 Red Blend 2010 at R45 a bottle is a blend of 58% Cabernet Sauvignon, 19% Merlot, 18% Cabernet Franc and 5% Petit Verdot. This was a pleasant fruity red wine. It was nice. Shiraz 2012 at R80 a bottle was the favourite of the tasting. It smelled fruity, was pleasant on the palate, a little spicy, fruity tasting, slightly dry tannins. It was nice. We preferred this over the Cabernet Sauvignon. Cabernet Sauvignon 2011 at R80 a bottle smelled lovely on the nose, was smooth on the palate, had dry tannins, I highly recommend decantering this wine. Both the Cab and the Shiraz have 4-6 years aging potential. 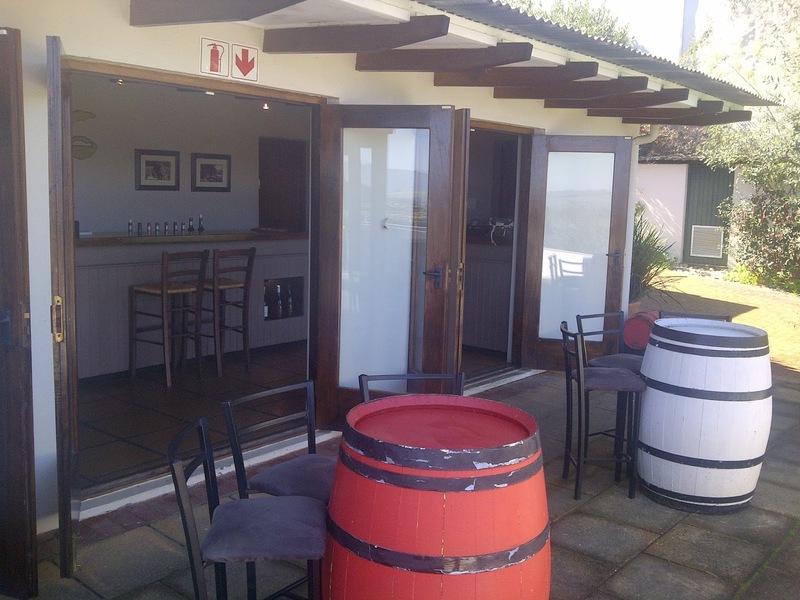 Summers Lease 2011 at R80 a bottle is a blend of 78% Shiraz, 21% Mouvedre, 1% Viognier. It was fruity, slightly spicy, a little dry also. Malbec 2011 at R130 a bottle was smooth yet had dry tannins. It was fruity. I didn't like this wine. It had 10-12 years aging potential. Perhaps it is a bit young to be drinking now? Pinotage 2012 (R85 a bottle) had a mocha smell and taste. It was smooth with light tannin structure. It was ok.
Pinotage Reserve 2011 (R140 a bottle) had dry tannins, was fruity, a bit more of a serious wine. Overall, we weren't that impressed with the wine. 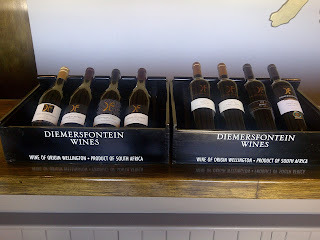 The service was good, Aubern was friendly, polite and gave an informative tasting. 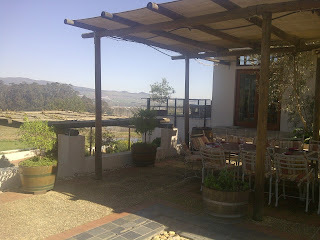 The setting and views were nice and the vibe/atmosphere was enjoyable and relaxing. We then moved to the restaurant for lunch. We sat outside and enjoyed the views. 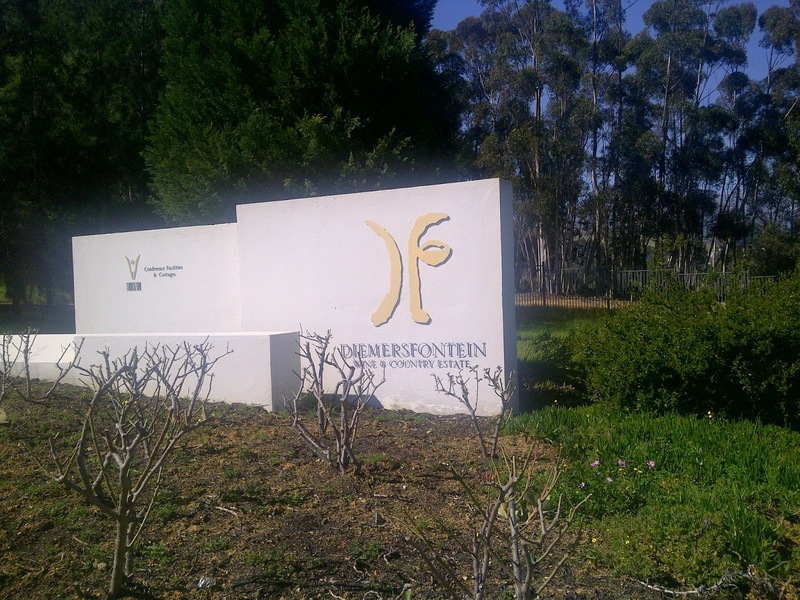 I had a glass of the Thokozani Chenin Blanc/Chardonnay/ Viognier and strangely it didn't taste like it did in the tasting room. The one I had in the tasting room tasted better. We enjoyed a nice two course meal here at Seasons Restaurant. The service was good, the staff were polite and friendly. The food was nice, the portions are quite big, so you are getting value for money here. 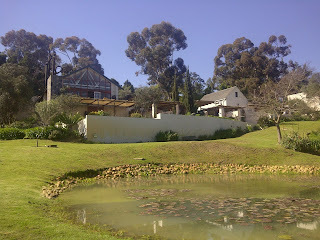 I recommend visiting this estate while in Wellington and would recommend eating at the restaurant also. Its not fine dining or anything close, but it was a pleasant experience overall.